I got the hearing aids today. Wasn’t too excited about going when it came down to it. Not sure what my deal was, just a lot of emotion to deal with, I guess. I have different domes on them, and both are thin silicone. I do not have ear molds at this time, but may request them because I’m not sure how I am adjusting to the domes. The dome on the right is larger and fills more of my ear canal since that ear needs more help (by filling more of the canal, it’s relying more on the hearing aid than air to deliver sound). I had trouble with the first dome she gave me for the left, it felt itchy, for lack of better description. She gave me a smaller one and I left with that, but then it felt like it kept coming out, so I put a big one on that side. But that then was irritating me, too, so I put the smaller one back on and am just trying to get used to it. It doesn’t seem to be falling out any more, at least. Then there is the issue of my glasses. I can’t even wear a headband because the pressure for them headband and my glasses makes the back of my ears sore. That’s what’s happening with the hearing aids, so I’ve taken them out and taken breaks a few times today. I am assuming my ears will get used to it in time. My voice sounds funny and I seem really loud. Need to get used to that. 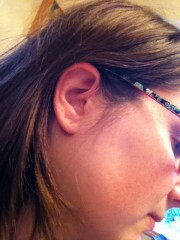 There are some sounds the hearing aids pick up, like when I push my hair back behind my ears, that is pretty annoying. There are things I never heard clearly before and sound weird, like the turn signals on the car and the keys hitting the dash as I drive. Some things seem really loud, like our garage door opener (SCREEEEEEEEEE!!!!!) and Nate. Ha ha! Poor Nate. I heard sirens twice today, which I’ve never heard before, despite the boys yelling out “Fire Truck!” when they hear them. I learned that my cell phone keys make sounds when I push them and that people walking next to my car when the window is down and I am stopped is audible. Some songs sound different now that I can hear more of the baseline. I find I am still not hearing great, but they also aren’t at the setting they will eventually be at to correct my hearing. They start out slow so as not to overwhelm you, and after going through a few hours with them on the starter setting, I can only imagine what it would be like to have them full force at the start! I got my bluetooth Streamer paired to my iPod and cell phone. The iPod setup is great, and I called Skip on my cell phone (from the bathroom) and it seemed to work fine. That will be a big improvement over my bluetooth headset that I was forever trying to push further into my ear because I couldn’t hear the person. Oh, and when Calsita got home, we climbed in my bed to watch TV and the first thing I did was grab the remote to turn it down, thinking it was SO loud… it was on volume level 15… normally I have it set to at LEAST 30, up to 60 (depending on what we are watching) so to have 15 be loud to me was hilarious! I can’t wait to try it some more while watching TV – I hate that I normally can’t lay down and watch because if one ear is blocked (laying on my side), I can’t hear anything. At times, it feels like they aren’t working. Especially on the right, since I have this dome shoved in my ear and it literally feels like it’s full of cotton. But then I turn them off or take them out and I realize just how well they ARE working. I can’t believe how quiet it gets when I turn them off. It really makes me realize how bad my hearing is, unfortunately. At the same time, it’s pretty nice to be able to get some quiet with something as simple as switching them off! I’m glad friends have warned me that it’s going to take getting used to, because it certainly is. I’d have been really frustrated and disappointed if I didn’t know that. It’s not like glasses where you can just put them on and see, that’s for sure. I go for another adjustment appointment next Thursday, and my audiologist said I should be able to wear them all day long in about a week.